BUCYRUS — Bucyrus Council 334 of United Commercial Travelers sponsored a Safety Poster Contest for children attending Hannah Crawford Elementary School. The contest was open to third-, fourth- and fifth-graders. Children did their own original artwork, but were allowed to use computer generated items, paste-on items from magazines, items made from construction paper, etc. Contestants also were allowed to pick their own subject of safety. A variety of subjects were picked including internet and social media misuse; bullying; weather and fire safety. Gracie Stirm was the first-place winner; Logan Cochran got the second-place award and the third-place winner was Sydney Stirm. Honorable mention winners were Ella Agee, Allison Chamberlin, Izzy Novack, Aiden Shull, Crystal Smith, Addison Kemery and Logan Cochran. 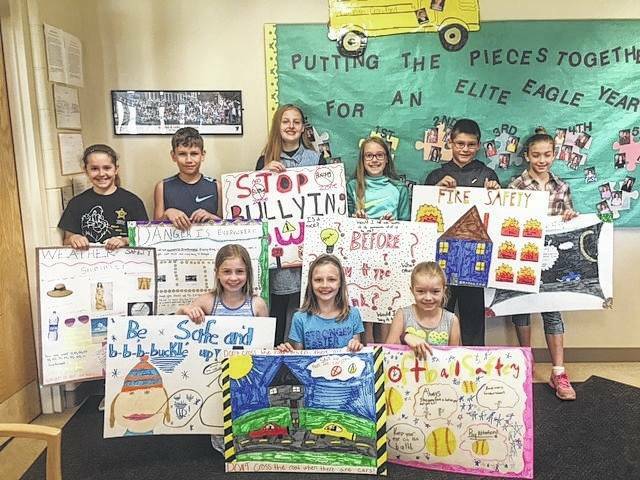 Students with developmental disabilities at Pioneer Career and Technology Center, under Fairway School teacher Cheryl Williams, also participated in the Safety Poster Contest for their own age and division. Students receiving honorable mention at this level included: Andrew Bishop; Namisha Clinard; Brittni Denzer; Shyna Drew; Lyndsay Kemerley; Harley Lewis; Derrick Meyer and Jamie Phillips. All posters were taken to Broadman, Ohio on June 8 to compete against other participants — in their divisions — from all over Ohio at the UCT Ohio Grand/Regional Convention. First-place winners at the regional convention will travel to Greenville, South Carolina in July where they will compete against other posters from all over the United States and Canada at the UCT Supreme Convention. Courtesy photo | United Commercial Travelers Picture d are winners and honorable mentions: Front row: Sydney Stirm, third place; Ella Agee, honorable mention; and Allison Chamberlin, honorable mention. Back row: Izzy Novack, honorable mention; Aiden Shull, honorable mention; Crystal Smith, honorable mention; Addison Kemery, honorable mention; Logan Cochran, second pPlace; and Gracie Stirm, first place. http://aimmedianetwork.com/wp-content/uploads/sites/38/2017/06/web1_IMG_3956.jpgCourtesy photo | United Commercial Travelers Picture d are winners and honorable mentions: Front row: Sydney Stirm, third place; Ella Agee, honorable mention; and Allison Chamberlin, honorable mention. Back row: Izzy Novack, honorable mention; Aiden Shull, honorable mention; Crystal Smith, honorable mention; Addison Kemery, honorable mention; Logan Cochran, second pPlace; and Gracie Stirm, first place.